Also available as leggings, socks and headwear - see related items. 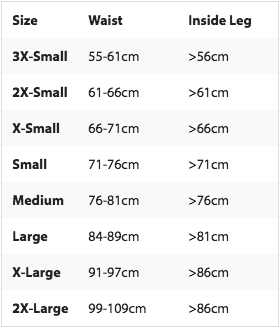 To use the size chart, find a size that best fits your waist and inside leg measurements. If you can't match both of these criteria, please take into account your body shape and choose the closest match. Please note that these garments have a fair amount of stretch and a single size could well span several sizes depending on how you would like it to fit.